The DVD RW is also known as DVD-RW, DVD+RW, or erasable/rewritable DVD. 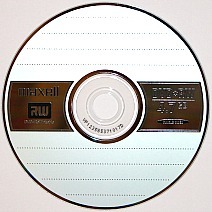 This disc is similar to the CD-RW, whereby information can be recorded to the disc, erased, and then the disc reused. There are two different versions of erasable DVD: -RW and +RW formats. There are some technical differences in these formats (see the DVD-R and DVD+R page). The +RW (an example is shown below) is supposed to provide drag and drop file saving and selective deleting. In other words the intent was for the format to behave more like a floppy diskette, hard drive, or USB flash drive, and have more flexibility in terms of how it could be used. For the -RW format that is shown in the image that follows, these features are not possible, and the whole disc needs to be erased before adding more files to the disc. The -RW format seems to provide better compatibility over a wider range of drives and overall has been the more popular of the two rewritable formats in the marketplace. Despite the differences, for the average user the formats are used interchangeably. The structure of the DVD RW disc and the way it stores the information is similar to the CD-RW and is illustrated in the following cross-section schematic. The DVD uses a phase change material as the information storage layer. This material originally is in crystal form and the laser light is able to change the material via heat to non-crystals in tiny spots. To erase the information, the laser heats and melts the phase change layer and crystals reform. 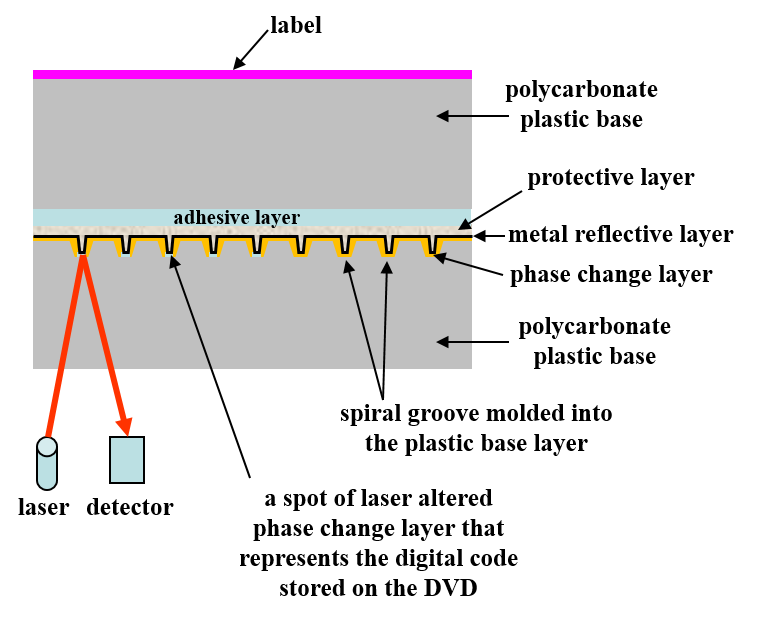 Although not shown in the cross-section diagram, two dielectric layers can be found on either side of the phase change data layer. These layers are present to dissipate heat, thereby protecting other disc layers from damage and enabling the phase change technology to properly function. More information can be found at the CD-RW page. Like other DVDs, the erasable DVD is two discs sandwiched together. The bottom disc has the molded spiral groove, phase change layer, dielectric layers, and metal reflective layer. The disc is only 0.6 mm thick which is half the thickness of the CD-RW disc (1.2 mm). An adhesive is placed on top of the 0.6 mm disc and then another 0.6 mm disc is glued to it and then a label is screened on top of this disc. This brings the total disc thickness to 1.2 mm, which is the same as the CD. Because the rewritable DVDs are only available in the single layer format (only one information layer that can store information) the top disc is simply a blank or dummy polycarbonate plastic disc with none of the other layers being present. The storage capacity of the DVD-RW and DVD+RW media is 4.7 GB and the maximum recording speed is 8x. These discs may be useful for transferring large files from one computer to the next or from person to person, but they are not recommended for the long-term storage of digital scrapbooking projects or other types of digital information. Some accelerated aging research has shown that these discs have fairly low stability relative to other types of optical discs and can fail or not function properly in only a short amount of time. An approximation of the average lifetime of DVD-RW and DVD+RW discs is 10 to 25 years. The research showed that the +RW formats are at the upper end of this range and the -RW discs at the lower end of this average longevity scale. Overall, the stability is rated lower than the CD-RW disc. 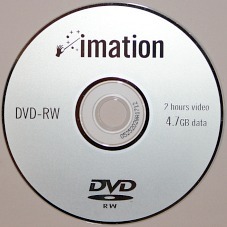 Overall, the DVD RW format was never in widespread use and used in less frequency than the CD-RW format.